You’ve seen them over a hundred times, these satin-finish bottles are in every bloggers denim shorts pocket and they’re going to be in my pockets this summer too. 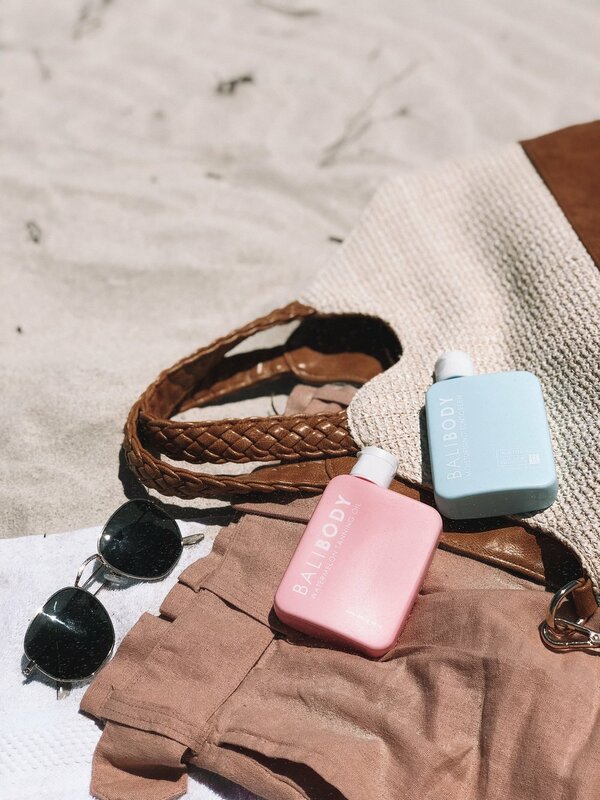 Nope, it’s not a magic potion for the Instagram girls beach body but these bottles will give you hydrated and glowing skin. I’m using the Bali Body pack called ‘The Golden Traveller’. It’s the most perfect name for the golden travel kit but also a good nickname for how I’ll look when I’ve finished these bottles off! You’ll find these stashed in my straw beach bag, accompanying me to explore sun-kissed beaches and relax on warm balmy summer afternoons. I’m heading over to Rottnest again soon and I can’t wait! Are you thinking about whether it’s better to treat yourself and get the bundle or just buy them individually? Here’s a review on every piece in The Golden Traveller bundle so you can decide! 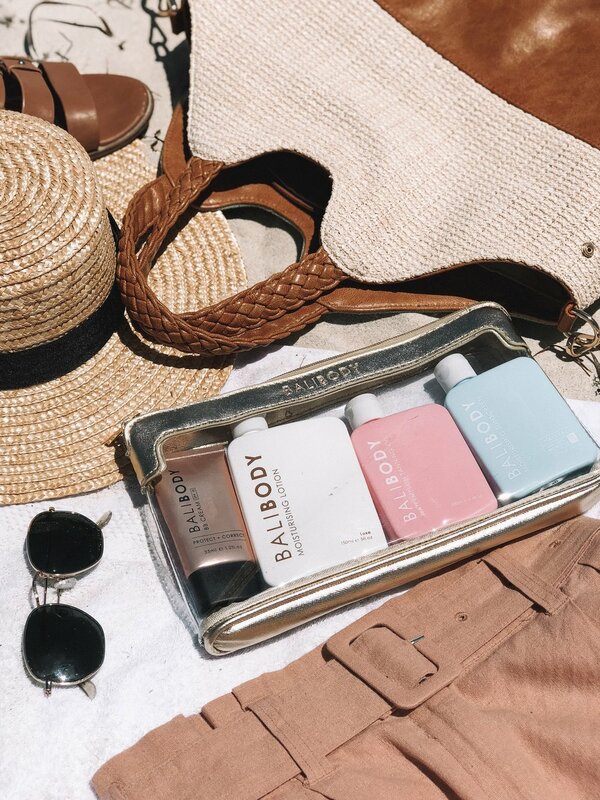 Either way, your Summer is going to be complete with some Bali Body in your bag! We all love a multitasking foundation. Wearing coverage that also does good things for my skin always makes me feel good! The Bali Body BB cream is made for everyday wear so I don’t have any clogged pores as a result of wearing it daily. This is a huge plus for me because if I’m not getting blocked pores, it means zero or minimal breakouts, which in turn means wearing less coverage makeup. It’s a full circle and it just takes that one step of wearing something that’s better for your skin for it to start on the cycle of repair and can lead to clearer looking skin. If you’re looking for a lightweight base for summer, the BB Cream would be a perfect choice. I would say that this isn’t like other BB or CC creams that I’ve used before. The coverage is very light, making skin look like a healthier and more hydrated version of itself. It feels like a thick CC cream when it comes out of the bottle and then feels wet and hydrating when applying with fingertips. Then, the foundation goes back to feeling more of a liquid foundation and can be easily blended with your fingers. I’d say that it has a dewy finish, but not as dewy as you would expect it to. You won’t be looking like a sweaty glowy mess, it’s actually very wearable and can look slightly satin. The formula contains a little light-reflecting tint to create this look. Think of it as a tinted moisturiser, it’s lovely to wear if you don’t have any blemishes that you’d like to conceal. The natural finish is complete with a nice glow but because I can get a bit oily around my T-zone, I like to set the BB cream with a bit of powder. Although it is light, natural looking coverage, you can build it up a slightly more to create medium coverage without getting cakey or feeling heavy. The way you apply the BB cream will determine whether it looks patchy or not. I think it’s best applied with warm fingers to spread the product out evenly, making sure you’re using a circular motion to cover all areas! My freckles still show through but I don’t mind it for every day or casual-wear. Personally, I would wear a heavier coverage if I was going out for dinner etc but this light coverage is enough to feel made-up every day. I did see this BB cream oxidise a little bit on my skin but it oxidised to match my skin tone! I have been using the Tan shade and it matches well with my false tan this week. I am happy with the BB Cream, mostly because it just does exactly what it says it will: Protect and provide natural coverage with a healthy dewy glow. I would love to see a medium coverage BB cream by Bali Body and wider colour range too. It mostly caters for lighter skin tones. Watermelon, Cacao or the Natural Tanning & Body Oil. I think Watermelon is the obvious choice! It smells exactly like watermelon Zappos! The Bali Body tanning oils don’t provide much sun protection against UV with SPF6 so I would recommend using sunscreen in combination with this to avoid getting burnt. I use this in conjunction with the Bali Body Moisturising Sunscreen to be sun safe. I have found that using the combo has kept my skin hydrated during long days at the beach and afterwards too. I hate getting sunburnt or peeling skin and I haven’t experienced this with the Bali Body products and my skin can be quite sensitive because it’s so fair. If you’re going to tan with this without using sunscreen, please be careful, I have read reviews from others who have used this without sunscreen - it does work well and it works very quickly. I used the sunscreen first then the tanning oil. I was so surprised at how moisturised my skin felt after being out in the sun as opposed to usually feeling dehydrated and dry. There is a slight coconut scent to the sunscreen, it isn’t overpowering and smells natural and fresh. The sunscreen itself provides medium protection with SPF15 so you’ll need to reapply every 1-2 hours to stay sun safe! It’s the perfect little bottle for travelling or just throwing in your bag last minute. Ps. Apply 20 mins before going into the sun! The body moisturiser is great to use every other day. I mostly remember to use it after I’ve been in the sun and I can feel my skin is a bit dehydrated. It’s light, non-greasy and keeps your skin feeling soft all day.I have started using it after my shower when I get home from the beach and it just works so well at stopping my skin from peeling. I have pretty fair skin so I could peel from the slightest bit of sun! I know I’ll be packing this one with me wherever I go this Summer, I might even keep it in my car. I always seem to have dry shins (no idea why!). I always make sure to moisturise them before I head out so the skin looks even and with the Aloe Vera, I’m helping repair the area at the same time! If you do have a really bad sunburn, please make sure you treat it as an actual burn! Don’t put any oils or lotions on it. I have to thank the packaging for saving my beach bag! I hadn’t done up my Watermelon Tanning Oil properly and it leaked a little bit! I’m so devastated but at least it was all inside the zip Golden Traveller case. It was so easy to clean out and pop all of my bottles back in ready for another day out in the sunshine. *Posted in collaboration with BaliBody.